Postcard TW-1240742 from Taiwan shows Swallow Grotto (Yantzkou 燕子口), a section of the Central Cross-Island Highway 500 meters from the Jinheng Park (靳珩公園) near Hualien, where the Liwu River twists and turns in the deep and narrow gorges. 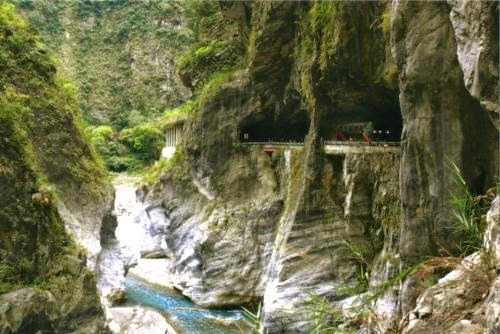 It is part of the Taroko National Park in Taiwan. Several tunnels had to be built for the highway to pass through cliffs. Visitors could walk through the tunnels, enjoy the sight of streams below, and numerous small swallow grottos on the marble cliffs. However, swallows have moved away due to heavy human impacts.